Central Lobby Consultants Ltd (CLC) is an independent parliamentary and public affairs consultancy. We have over 20 years' experience working within Westminster, Whitehall, Europe and the devolved bodies. CLC has considerable expertise in managing strategic lobbying programmes in both the UK and EU. We also have long-standing experience of assessing the impact of EU legislation at a national level. We regard it as crucial to identify and secure the appropriate technical and legislative solutions to our clients' problems in order to provide lasting results for their businesses. We specialise particularly in providing hands-on assistance with this kind of "technical lobbying", focused particularly on negotiating with Ministers and senior civil servants. CLC's role is to help clients develop their key messages and then ensure that they speak to the right people. We organise political contact programmes with appropriate officials and parliamentarians, which can be invaluable in ensuring that they are familiar with clients and are confident about involving them in future discussions. Although we participate in these events, we go to great pains to ensure that we are discreet enablers rather than direct advocates, believing strongly that clients are best placed to speak for themselves. The monitoring service that CLC provides for clients is an intelligence tool - it is not merely a cuttings service - which sets in context the information provided. By combining attention to detail with a thorough understanding of our clients' businesses we are able to offer a thorough and targeted monitoring service without bombarding clients with irrelevant material. CLC organises a variety of events for clients, ranging from small, informal seminars addressed by Ministers to large-scale international conferences. These can raise the profile of a client, increase awareness of an issue amongst key opinion-formers, or progress clients' interests by offering a forum for the exchange of views with policy-makers. CLC also has particular experience of organising fringe events at Party Conferences. CLC was one of the first consultancies to offer systematic audits of clients' public affairs activities. Our role can range from assessing briefing materials and updating contact databases to advising on sophisticated political strategies. CLC can provide parliamentary drafting services for clients, and has particular expertise and considerable experience in drafting amendments to Bills and draft European legislation. CLC undertakes focused research on emerging issues that may affect its clients. CLC's rigorous analysis and research ensures that clients have the most comprehensive information available, not superficial reportage. Our ability to approach officials from an independent standpoint provides invaluable insight. 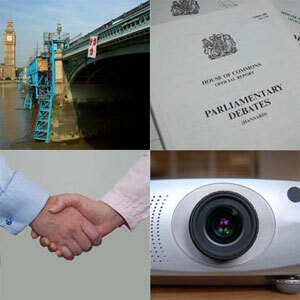 CLC offers targeted training sessions on both UK and EU Parliamentary procedures. The training we provide is tailored to the particular experiences and needs of the trainee, whether that be a crash-course on the workings of the Westminster Parliament or a detailed explanation of the EU's 'co-decision' procedure. CLC also provides advice on how to handle presentations to Select Committees, including participating in "dry-runs" for potential witnesses. CLC provides secretariat services to many of its clients, often at the same time as devising and implementing their lobbying campaigns. Two such clients are large European associations with members based in 15 different countries. One of our Directors is also Secretary of the Churches' Legislation Advisory Service, a role that involves both organisation of meetings, intelligence-gathering and regular briefings. We also provide the secretariat for three All-Party Parliamentary Groups.